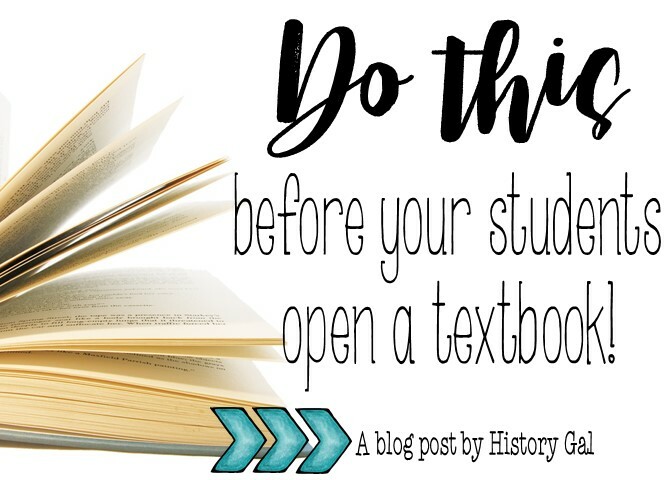 Do This Before Your Students Open a Textbook! Have you ever done things a certain way for years and then had a revelation that you've been doing it wrong? Well, this happened to me a few years ago. I've always liked to assign reading homework to my high school students so they'd be prepared for the next day's lesson. And, every time, the results were dismal. I'd pretty much given up on having students read when a conversation I had with some other teachers helped me realize that I was going into the new school year with a huge assumption. I assumed that somewhere along the line - in middle school or as freshmen - that my students had been taught HOW to read secondary sources. So, I decided I needed to fill this gap. I couldn't just keep doing the same old thing. I needed to give my students the tools they needed to read a secondary source like their textbook. And, I wanted to make it more enjoyable then me standing at the front of the room and telling them. First, I created an acronym to help students remember what to do. Reading a secondary source is not the same as reading a novel. Students need to train themselves to look at and read the text differently. The acronym I came up with is SAAR. Then, I created a doodle notes page and a short PowerPoint for the reading steps. I created a blank version for my upper level students as well as a fill-in-the-blanks version for my lower level students. I have a short teacher-lead instructional period to cover the material on the doodle notes page and then the rest of the class is spent in stations. Station 1: Students use color to identify primary and secondary sources. Station 2: Students do a card sort to identify primary and secondary sources. Station 3: Students practice reading a secondary source. 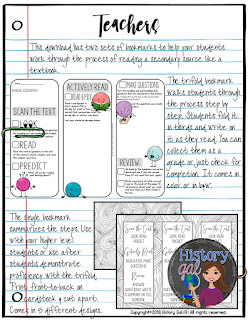 If you don't want to create your own lesson, my doodle notes and stations for reading primary and secondary sources are for sale in my History Gal store here or click the image below. It doesn't matter if you are reading this post at the beginning of the school year or in the middle of the year. 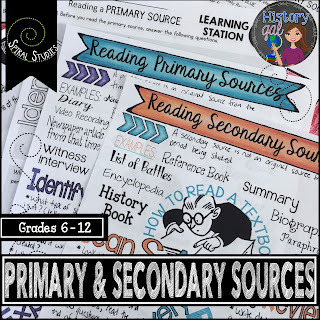 You can teach your students how to read a secondary source at any time in the school year. To help, download this free set of bookmarks - one sets guides students through the process while they read and the other set is a reminder of the steps. Do you like this post? If so, sign up to get emails from me! Each email is filled with ideas and tips for teaching social studies to middle and high school students. 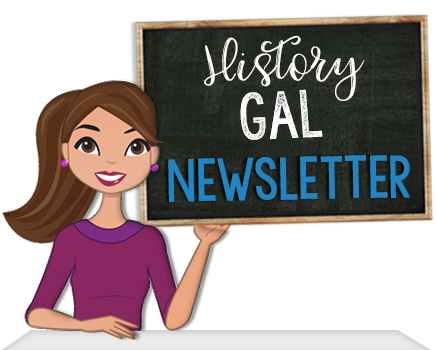 I will also send you some emails about giveaways, quarterly sales at my History Gal store, and product information. Growing a Classroom Library? Add these books! 5 YouTube Channels That Rock!